How can Genesis 15:13 says that the Israelites were enslaved for 400 years? Here is another point that has been made. Kohath lived 133 years (Exodus 6:18), while Amram lived 137 years (Exodus 6:20). If we generously allow that Kohath was a newborn baby, when the family moved to Egypt, and that he begat Amram in the very last year of his life, and that Amram in turn begat Moses in his very last year, we only get 133 + 137 + 80 (Moses’ age when leaving Egypt, Exodus 7:7). That’s a maximum of 350 years for the entire sojourn. Good times as well as bad times. 350 years is the most we can stretch those 3 generations to, but it gets even worse, when we remember again that Amram married his own aunt, Jochebed . There’s no need to do the exact math here — suffice it to say that since there’s one less generation on the distaff side than on the sword side, it means in rough numbers, that Jochebed would have had to be as old as Kohath and Amram combined. Admittedly the Bible doesn’t state in so many words that Jochebed wasn’t 270 years, when she gave birth to Moses, but this would mean the she was thrice as old as Sarah was, when she conceived. This question has an open bounty worth +200 reputation from Isaac Moses♦ ending in 5 hours. Yeyasher kochacha to Alex, co-winner of the latest Best Answer Contest! The commentators almost all agree that the four hundred years was not the time spent in Egypt. Rather, the four hundred years is from an earlier time (with some disagreements as to what that time is). Most of the commentators agree that the actual time spent in Egypt was two hundred and ten years. Other possibilities suggested are two hundred and twenty five years, two hundred and twenty seven years, two hundred and forty years, and two hundred and seventy years, with the outlier view that the entire time mentioned was indeed spent in Egypt itself. Abraham was 75 when he left Haran (Genesis 12:4). Abraham was 100 at Isaac's birth (Genesis 21:5). Isaac was 60 at Jacob's birth (Genesis 25:26). Jacob was 130 when he went down to Egypt (Genesis 47:9). Jacob spent 17 years in Egypt and died at 147 (Genesis 47:28). Moses was 80 at the Exodus (Exodus 7:7). The question of the length of the exile was taken up by virtually every commentator. Most of them, e.g. Rashi (commentary to Exodus 12:40), Rashbam (commentary to Exodus 12:40), Bechor Shor (commentary to Exodus 12:40 one approach), et al, assume that the four hundred years prophesied to Abraham were from Isaac's birth while the four hundred and thirty years mentioned in Exodus 12:40 were from the time of the prophecy. Thus, the prophecy occurred thirty years before Isaac's birth, when Abraham was seventy. The actual amount of time spent in Egypt was only two hundred and ten years, according to the Sages; this can be calculated by starting with four hundred and subtracting the sixty years for Isaac's age at Jacob's birth and subtracting one hundred and thirty years for Jacob's age when he entered Egypt. 400 - 60 - 130 = 210. And of course, as noted in the question, it is impossible to reach four hundred years with just the generations of Kehat, Amram, and Moses. This approach is also justified by the claim in Bava Batra 119b (translation) that Jocheved was born when they entered Egypt, was one hundred and thirty years old when she gave birth to Moses, and Moses was eighty years old when they left Egypt (130 + 80 = 210). The most glaring issue with this theory is that it requires the prophecy at the Covenant Between the Parts to have occurred when Abraham was seventy years old. Yet the text in Genesis 12:4 explicitly states that Abraham was seventy five years old when he left Haran. In order to avoid this issue, many of the commentaries adopt the idea in Seder Olam (Chapter One), that Abraham was seventy at the time of the prophecy but then returned to Haran for five years (until he was seventy five) and then came back to Canaan, and the verse is saying that he was seventy five when he left Haran for the last time. Radak (commentary to Genesis 15:13) instead modifies the four hundred and thirty years to have started five years before the prophecy, when Abraham was first told to go to Canaan. This is also Bechor Shor's "peshat" approach (commentary to Exodus 12:40), and R. Elijah of Vilna adopts a similar approach in his commentary to Seder Olam . Another issue that most of these commentaries do not address, is why the Torah uses two different calculations. A different variation of this is offered by R. Chananel (commentary to Exodus 12:40) and R. Bachye Ben Asher (commentary to Exodus 12:40). They argue that the four hundred and thirty years starts from Isaac's birth, and the four hundred years starts from the beginning of the hardships of Abraham's progeny and that the three different figures were based on merit. However, this would mean that the four hundred years began when Isaac was thirty years old, but they don't identify anything significant that happened then. Using this calculation, the actual time in Egypt would have been two hundred and forty years (430 - 60 - 130 = 240). Ramban (commentary to Exodus 12:40) suggests that both calculations are referring to the same time period, which was four hundred and thirty years. However, God did not bother to specify the additional thirty years to Abraham, and simply told him the imprecise number of four hundred years. Like Ramban, Abarbanel (commentary to Exodus Chapter 12) also first mentions the possibility that the four hundred years told to Abraham was imprecise, and then suggests that it was supposed to be four hundred years but thirty years were added on due to the sins of the Israelites. R. Joseph Ibn Kaspi (commentary to Exodus 12:40) states that the four hundred and thirty years must be a reference to the beginning of Abraham's sojourning, i.e. when he first left his birthplace. He appears to also suggest that four hundred and thirty might not actually be a precise number, and he seems to allude to the fact that the four hundred years mentioned in the prophecy are to be counted from Isaac's birth. Elsewhere (commentary to Genesis 15:13) he simply writes that R. Abraham Ibn Ezra has already explained this. In his supercommentary to Ibn Ezra's commentary to Genesis 15:13 he explains that the Israelites were only in Egypt for two hundred and ten years, and the four hundred years is from Isaac's birth. However, Ibn Ezra's commentary to Genesis 15:13 is a bit cryptic. He writes simply "עד סוף זה הקץ מהיום" which could mean that the four hundred years start from the day of the prophecy. In his commentary to Exodus 12:40 Ibn Ezra deals with the timeline at greater length. He makes the exact argument mentioned in the question here — that by adding up the ages of Kehat, Amram, and Moses at the time of the Exodus you can't get to more than three hundred and fifty years — and concludes that the four hundred years are from Isaac's birth, while the four hundred and thirty years are from when Abraham first left his homeland at the age of seventy, five years prior to the prophecy. It is perhaps noteworthy that the Samaritan Pentateuch and the Septuagint have a slightly different version of Exodus 12:40, in which the four hundred and thirty years are explicitly stated to include the time in Egypt and the time in Canaan. This could either be indicative of an alternate text, or it could be a "correction" in order to reconcile the timeline. Indeed, the Talmud (Megillah 9a) claims that the Sages who translated the Torah into Greek added in the words "and other lands" to this verse. This fact is noted by R. Samuel David Luzzato (commentary to Exodus 12:40) who notes that most of the later scholars agree that this was a "correction" (to reconcile the timeline) rather than a true alternate text. Elsewhere (commentary to Exodus 6:20) Luzzato argues that the Israelites were actually in Egypt for four hundred and thirty years. He bases this on the fact that the verse in Numbers 3:28 states that there were eight thousand six hundred members of the Kehat family in the wilderness, which would be impossible if the generational sequence of Kehat > Amram > Moses is taken at face value. Rather, there must have been unnamed generations, and those generations account for the four hundred and thirty years in Egypt. He then quotes another suggestion, that the lifespans mentioned for Levi, Kehat, and Amram are actually the number of years until the families split off into separate groups. The number given for Amram is one hundred and thirty seven (Exodus 6:20), the number for Kehat is one hundred and thirty three (Exodus 6:18), and the number for Levi is one hundred and thirty seven (Exodus 6:17). If you add the seventeen years that Jacob was still alive in Egypt, you get four hundred and twenty four years (137 + 133 + 137 + 17 = 424), which is approximately the four hundred and thirty years mentioned. Of all the commentators to address this issue, Ralbag probably dealt with it at greatest length. He introduced several novel points. First, he criticized those who dated the four hundred years from Isaac's birth, because they had to then accept the account in Seder Olam that explained how the Covenant Between the Parts took place when Abraham was seventy. Ralbag rejects this as untenable because it is inconceivable that Abraham would have gone back to Haran after God had commanded him to go to relocate to Canaan. Furthermore, Ralbag assumes that the covenant would have had to occur much closer to Isaac's birth because Abraham hadn't yet despaired of having children thirty years prior to Isaac's birth. And he assumes that this is connected to Sarah giving Hagar to Abraham which was around fifteen years before Isaac's birth. Perhaps uniquely among the commentators, Ralbag argued that the four hundred years began with Jacob's birth. This was because Jacob was the first of Abraham's progeny to sojourn in an ongoing manner. Moreover, Ralbag also uniquely argues that the four hundred years were not actually fulfilled, even counting from well before the actual stay in Egypt. Instead he argues that God shortened the time period in the merit of the Patriarchs as is implied in the account in Exodus (presumably 2:24). In fact, Ralbag uses this as a further critique of the other views, as according to them the full four hundred years were fulfilled. Ralbag also explains why the number four hundred and thirty differs from the number four hundred. He argues (as did Rashbam) that the verse should be read as if there was an additional word "until" (as we find in other instances) in which case the verse is simply saying that it occurred four hundred and thirty years after a certain point, rather than that there were four hundred and thirty years of the prophesied hardships. Ralbag presents two options as to what that certain point was: either Isaac's birth, or the prophecy itself. Thus, the amount of time actually spent in Egypt was either two hundred and forty years or two hundred and twenty five years (430 - 130 - 60 = 240 or 430 - 130 - 60 - 15 = 225). Four hundred years. Meaning to say, until the end of four hundred years from the time of Jacob's birth, as he was the first of the sojourners from [Abraham's] seed to sojourn ongoingly in a land not belonging to them. And behold God expedited the end by about sixty years, if [we assume that] the Israelites only dwelled in Egypt for two hundred and ten years, as the Sages say. And it is possible for someone to say that the Israelites dwelled there for two hundred and seventy years. 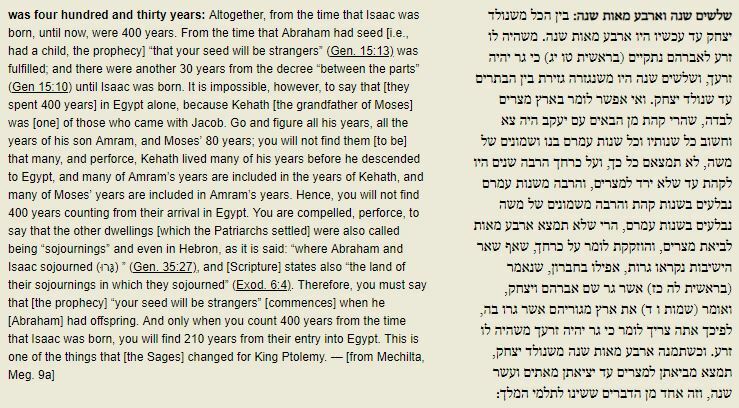 And this is because Kehat was possibly around two years old when they came to Egypt, and it is possible that one hundred and ninety years after this Amram, who was the son of Kehat, begot Moses. It is impossible to say that the end [of the four hundred years] was from Isaac's birth, because then the end time mentioned in Parshat Bo, which was four hundred and thirty years, cannot be completed. This is because Abraham left Haran twenty five years before Isaac was born and this prophecy had to have occurred after Abraham had come to the land of Canaan, at the time when Abraham began to give up on having children which is why he said "I go childless". And it would seem that this prophecy was near [the time of] the giving of Hagar to Abraham as a wife. And that which the author of Seder Olam said, that after this prophecy Abraham returned to Haran and stayed there for five years, in order to reconcile the calculation mentioned in Parshat Bo, does not seem correct to us. This is because Abraham did not give up on having children until he was eighty five years old, when he had lived in the land of Canaan for ten years, which is why Sarah then crafted the plan [for Abraham to marry Hagar]. This is because it would appear that his statement "I go childless" should have been around this time. Additionally, you don't find that Abraham left the land Canaan, which God had commanded him to dwell in, if not for a strong reason such as the harsh famine. For without this [strong reason] he would be violating the command of God. therefore it is not possible to say that he returned to Haran and stayed there for five years. And furthermore, the verse tells us that when they came to the land of Canaan they came to Haran and they dwelled there; this is to show that they did not come from the land of Canaan to Haran. Moreover, if this was the case [that the four hundred years started from the birth of Isaac] then God did not expedite the end when he took Israel out of Egypt, yet it appears from what is written there that he did expedite the end on account of His covenant with the Patriarchs. What appears to me is that the end is [calculated] from the time of Jacob's birth until the completion of four hundred years. And God expedited the end by thirty years because of the harshness of the difficult labor that the Egyptians forced upon the Israelites, as it says "the Israelites sighed from the servitude and they cried out". And the calculation of four hundred and thirty years was from the time that Abraham had a child, meaning from the time that Isaac was born, as with Isaac he was considered a child and from him as well were the descendants that were exiled in a land that was not his. And the dwelling of the Israelites in Egypt was two hundred and forty years, and this fits very nicely with this topic. And it is also possible that the calculation of four hundred and thirty years was from the time this prophecy came to Abraham, which appears to have been no less than fifteen years before Isaac was born. This is because after this [prophecy] Sarah gave her maidservant to Abraham, and Abraham was then eighty five years old. And God expedited the end, according to this assumption, by about forty five years. And due to the sin of the scouts they were delayed in the wilderness for forty years, which left them entering the land five years before the end [of the four hundred years]. And this fits very well, as we will God-willing explain in what comes, namely, that the end for them to enter the land had not yet come after Moses died, and because of this they needed to be in a state of perfection so that the Divine Providence would cling to them in a manner that would be victorious over those nations. And the dwelling of the Israelites that they dwelled in Egypt was four hundred and thirty years. The word "until" is missing. And so too "forty he shall strike him", meaning that the intent of it is until [but not including] forty, as we will God-willing explain there. And the intent of this is that Israel dwelled in Egypt until four hundred and thirty years, but it doesn't explain from what time this calculation began. What appears to me is that this calculation began either from the time of the birth of Isaac or from the time of the prophecy between the parts, as we explained in Parshat Lech Lecha. And what is fitting in my eyes regarding this is that it began from the time of the prophecy between the parts. And the prophecy between the parts was about fifteen years before Isaac was born. And this calculation began from that prophecy. And the four hundred years that God said to Abraham began from the time of Jacob's birth, for he was the first one who ongoingly sojourned in a land not his. And Israel left Egypt before the end [of the four hundred years] that was said to Abraham by about forty five years. And it is clear that had Israel been perfect they would have inherited the land [of Canaan] immediately after leaving [Egypt], before the end [of the four hundred years]. And that is why Moses sent scouts to tour the land of Canaan a short time after they left Egypt. But their sins diverted them and they were delayed there in the wilderness for forty years. And after that they inherited the land through Joshua. But despite this their inheritance of the land was still fulfilled, whether with the coming of the end that God had promised Abraham or slightly earlier, as will be explained with our words in what is to come. I.e. they already inherited the land before the end [of the four hundred years]. A final noteworthy point is that Rambam (Epistle to Yemen — Iggeret Teiman) explains that although the correct calculation of the four hundred years ended up being from Isaac's birth, the prophecy itself was vague and the calculation could have been from some other point, and various people did mistakenly calculate it until the correct calculation became known through Moses taking them out of Egypt four hundred years after Isaac's birth. Before I actually answer your question, I'd just like to make one note. Jochebed, our Sages tell us, was 130 years old when Moses was born (Numbers Rabbah 13:21). She was born as the Israelites crossed into Egypt. Her son, Moses, as you mentioned, was 80 when they left. Thus, the Israelites were in Egypt for 210 years. This still is less than 400. Now, there's also a third number for how long the Israelites were in Egypt: 430 years (Exodus 12:31). So how could the Israelites be in Egypt for 210 years, 400 years, and 430 years at the same time? The answer is that they are counting from different time periods. 430 is counting from the Covenant Between the Parts (the event in which the verse in Genesis 15 appears), 400 is counting from Isaac's birth, and 210 is counting from when Jacob's family actually entered Egypt. The calculations are shown here. In fact, God still took the Israelites out of Egypt exactly when he told Abraham he would. Note that a few verses after the one we've been discussing God tells Abraham that the fourth generation will leave Egypt. Levi was the first generation, his son Kohath the second, his son Amram the third, and his son Moses the fourth. Now, the question still remains: why did God not leave them in for the full 400 (430) years? There are two approaches, both recorded in this answer to a highly related question, that presupposes what I'm about to tell you. The first is that the verse is misleading. The antecedent of the promise of 400 years is not the immediately preceding clause of being enslaved, but rather the first clause, that they would be strangers in a land not theirs. Indeed, as the Land of Israel was still called the Land of Canaan at that point and was not yet given to the Israelites, Isaac was born in a land not his. The second approach is that the Israelites indeed were in Egypt for 400 years' worth of slavery. But the verse is referring to 400 years' worth of normal slavery. The Egyptians worked them so hard, the 400 years were "compressed" into only 210. There's a third approach I've heard, referenced in this question: the Israelites actually were in Egypt for 400 years. As you mentioned, the numbers don't seem to work out. For a different reason, Samuel David Luzzato, who posed this theory, has an issue with the Levites' timeline, and so he poses the otherwise difficult theory that there were generations not mentioned between Levi and Moses (cited in Hebrew here, on his comments to verse 20). 40 Now the sojourning of the children of Israel and fathers of them, who dwelt in Canaan and in Egypt, was four hundred and thirty years. 41 And it came to pass at the end of the four hundred and thirty years, even the selfsame day it came to pass, that all the hosts of the LORD went out from the land of Egypt. 40 And the sojourning of the children of Israel, while they sojourned in the land of Egypt and the land of Chanaan, was four hundred and thirty years. 41 And it came to pass after the four hundred and thirty years, all the forces of the Lord came forth out of the land of Egypt by night. Since from Abraham's receiving the prophecy to the entrance into Egypt 215 years have elapsed (see Alex's impressive answer), which represent precisely half of the total figure, the conclusion immediately follows. This is then further supported by adding the ages of all those that have lived in Egypt (again, see Alex's beautiful answer), which add up to exactly 424 years. Since people beget children neither when they're in diapers, nor when they're on their deathbed, the most intuitively tempting solution would be to cut the value roughly in half, yielding almost the same result as before. I would also like to point out that these two numbers, 215 and 430, are decimal approximations of duodecimal quantities; basically, if people were to count in base twelve rather than base ten, then 216 and 432 would represent an eighth and a quarter, respectively, of a thousand, or 123 = 1728. Notice that the same amount of time, 430 years, also coincides with the total duration of Solomon's Temple, since the reigns of all kings starting with that of its builder add up to 433 years, and its construction commenced near the beginning his fourth year as ruler of Jerusalem, see 1 Kings 6:1. There is also a numerical niceness about these 430 years being followed by a span of exactly seven decades, so as to ultimately yield a very round period of precisely half a millennium. A similar period of time, of 7 x 62 = 434 years, also appears in the Book of Daniel, where, once again, the connection to the Second Temple is made evident. As for the time span between the Exodus and the First Temple, the Masoretic reads 480 years, whereas the Septuagint of 1 Kings 6 has only 440. Usually, this discrepancy is explained in terms of the 40 years between the Exodus and the entrance into the Holy Land, but, in light of the above, I interpret it once again as a decimalization of formerly duodecimal quantities, since the 480 is an easily recognizable multiple of twelve for those commonly using base ten, whereas the 440 is an upper rounding of the 432 mentioned earlier, sandwiched between two lower roundings of the same initially dozenal amount. As for the 424 years mentioned above, it is possible to argue, based on a certain careful reading of the Book of Genesis, that there were 425 years from Noah's Flood to Abraham's receiving the prophecy. Personally, I consider Biblical chronology, in all its three well-established historical forms (Masoretic, Samaritan, and Septuagintal), as nothing less than an utterly sublime numerical symphony. Hope this answer will help provide the reader with some deeper meaning, understanding, insight, and perspective into the topic at hand, since things seldom seem to make any sense when divorced or viewed in isolation from their much larger context, but when all pieces of the puzzle are finally fitted together, the end result is deeply rewarding, and well worth all the effort. Not the answer you're looking for? Browse other questions tagged tanach yetziat-mitzrayim parashat-lech-lecha . Why is the actual length of Galus Mitzraim not mentioned in the Torah? How old was Pharoah when he died? How Avraham could receive the Divine Presence?